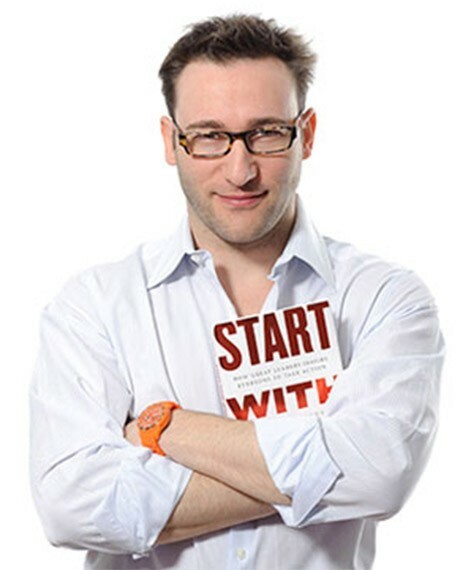 Simon Sinek introduced the Golden Circle. He suggested we Start With Why. Now, with a new book coming in January, he looks at how we can create an environment where people thrive. Simon Sinek can predict your future. By simply walking through the hallways, he can tell whether your business will succeed or fail. That’s because Sinek believes an organization’s future doesn’t hinge on its stock ticker, but in the attitudes and culture of its employees. Do people feel safe at work? Sheltered from perceived danger? Do they know, deep down, that the leaders have their best interests in mind and will take care of them? In his first book, Start With Why, Sinek examined how focusing first on why an enterprise exists can better inform both what it does and the how it does it, thus creating a more successful and compelling company. The book and his TED talk — viewed almost 13 million times — launched Sinek into the spotlight as a modern philosopher for executives, entrepreneurs, and organizational leaders. His latest book, Leaders Eat Last: Why some teams pull together and others don’t, coming out in January, delves into the who of any organization — its people — and how leaders can create an environment built for success. Sinek began his pursuit by asking a series of questions about transformational leadership and how it intersects with the very nature of humanity. Sinek says he wanted to know under what circumstances do humans best function? What he discovered was that people are designed to work as a community. When we look out for one another, we all benefit. As Sinek explains, even our chemical make-up rewards us for this behavior with feelings of fulfillment, acceptance, and safety. This is what Sinek says he learned. In the time of the cave man, danger was constant. Unpredictable weather, predatory animals, limited resources, and hostile geographic phenomena threatened humanity’s very survival. Quite literally, life was not safe. This was the reality of the world then, and it remains the reality today. Even though predatory animals are now most often observed in enclosures, Sinek says that other dangers have emerged, especially in business — the fickleness of Wall Street, a wavering economy, unpredictable world events, aggressive competitors, and new technologies that render businesses obsolete. For example, McDonald’s leaders could not have predicted that a small sandwich chain would pass it as the largest fast food restaurant in the world, but that’s what Subway restaurants has done. In 1982, Subway founder Fred DeLuca set a goal of the chain opening 5,000 stores by 1994. The company hit that mark by 1990. Today the number of stores is approaching 40,000, and the company is shooting for 100,000 by 2030. And now the sandwich chain is the top choice for workers at lunch, passing McDonald’s in the first quarter of 2013. These outside dangers cannot be controlled by the individual employee. Within this chaotic environment resides your organization. If you’ve built it properly, Sinek says, the company offers a ring of safety engineered to help not just investors, board members, and C-level executives, but the entire enterprise. A circle of trust that reaches the outermost edges of an organization ensures that the company will survive and thrive. Why? Because people, all people, function best in environments where they feel safe. If leaders create a hostile work environment within the organization, Sinek says employees will be forced to protect themselves from internal dangers as well. Think about it: If you’re an employee and you’re constantly worried you’ll lose your job, you’re less likely to take risks, be innovative, push for change, or promote a colleague’s ideas. Employees who do not feel protected at work feel vulnerable, self-interested, cynical, paranoid, and stressed — for biological reasons. Managers can’t just instruct their teams to trust one another and cooperate. Those are not things people decide to do, but rather the natural result of team members feeling safe and having a shared value set. Those are things that can only be developed over time. “There’s no app that can speed that up,” says Sinek. Sinek says leaders have two responsibilities when maintaining a healthy circle of trust. First, they’re responsible for determining how porous the circle is. Who is allowed to join? By what criteria are new employees measured? Hiring managers must give value to candidates’ overall character as well as their résumés. Even if a company hires all the Ivy League MBAs in the world, it’s no guarantee they will create a cooperative company. The second thing leaders determine is the size of the circle of trust. Sinek says that when the circle is extended to all employees in an organization everyone feels secure and is inclined to look after the customers and clients. Sinek references the universal travel experience of having a frontline employee being totally unreasonable because “those are the rules.” How many times have you heard someone say, “Sorry, sir, I have to follow the rules, otherwise I’ll lose my job?” Sinek asks. Compare that to the employee who is empowered to make decisions that will directly impact customer satisfaction. Company leadership is responsible for looking after its people, who will then, in turn, take care of customers. “Leaders have to make the priority those who are responsible for the company’s success, ahead of those who simply benefit from the company’s success,” says Sinek. Sometimes that means taking a financial hit to save the jobs of your loyal employees or giving them the benefits they deserve. To get those results, leaders often have to go to battle. Employees at Costco don’t get paid double their Sam’s Club counterparts by coincidence. Someone had to go to battle for that. And guess what, those investments have translated into higher productivity and sales for Costco. Humans are anthropologically engineered to support the idea that the alpha, or leader, reaps more rewards because he or she takes on more of the risk. Sinek says he found that people are perfectly comfortable with someone more senior getting a bigger paycheck, a nicer car, bigger office, or more attractive spouse. There are huge perks with being the alpha, but it does not come for free. When danger appears on the horizon, the alpha is expected to rush in to meet it. That is the cost of leadership. A leader protects those in their group and offers them a circle of safety. It is a decision, and Sinek says to not be surprised when it’s hard work. Being in charge does not grant you the right to do less, but gives you the responsibility to do more. Sometimes that requires you to put your own reputation or even career on the line. But the reward is a dedicated workforce that feels safe, cooperates, survives, and thrives. In studying the leaders who’ve had the greatest influence in the world, Simon Sinek discovered that they think, act, and communicate in the exact same way — and it’s the complete opposite of what everyone else does. Sinek calls this powerful idea The Golden Circle. Imagine three concentric circles. In the outermost ring is the ‘What.’ It’s what you do. The second ring covers “How” you do it. The innermost ring, the bullseye, is the “Why.” Sinek’s Golden Circle provides a framework upon which organizations can be built, movements can be led, and people can be inspired. And it all starts with why. Any organization can explain what it does; some can explain how they do it; but very few can clearly articulate why. Why is not money or profit — those are always results. Why does your organization exist? Why does it do the things it does? Why do customers really buy from one company or another? Why are people loyal to some leaders, but not others? Starting with why can help inform an organization’s what and how. Using examples ranging from the Wright brothers to Apple Computers to Martin Luther King, Jr., Sinek shows how this process works in big business and small business, in the nonprofit world, and in politics. Those who start with why never manipulate, they inspire. And people follow them not because they have to; they follow because they want to. Simon Sinek’s mission is to help people wake up every day inspired to go to work and return home every night fulfilled by their work. His first book, Start With Why, offered the essential starting point, explaining the power of focusing on WHY we do what we do, before getting into the details of WHAT and HOW. Start With Why became an instant classic, with a loyal following among Fortune 500 companies, entrepreneurs, nonprofits, governments, and the highest levels of the U.S. Military. Now Sinek is ready to reveal the next step in creating more productive organizations. He explains, in simple terms, the biology of trust and cooperation and why they’re essential to our success and fulfillment. Organizations that create environments in which trust and cooperation thrive vastly out perform their competition. And, not coincidentally, their employees love working there. But “truly human” cultures don’t just happen; they are intentionally created by great leaders. Leaders who, in hard times, would sooner sacrifice their numbers to protect their people, rather than sacrifice people to protect their numbers, are rewarded with deeply loyal teams that consistently contribute their best efforts, ideas, and passion. exactly!!! Thank you! Great article.